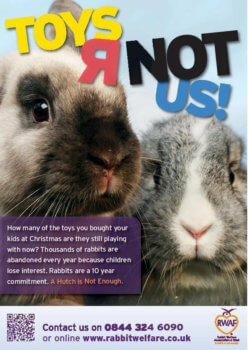 Remember not to give pets as gifts at Christmas, or any other time. Adults should always be responsible for the family pets and should be able to commit to them for their lifetime, which could be long after the children have left home. Additionally, rabbits can be more expensive to care for properly than you would think, estimates are between £9,000 – £11,000 for their lifetime – and that is without unexpected vet bills! Not a cheap childrens’ pet at all!